The release of Solibri Model Checker (SMC) v9.8 adds a powerful feature: 2D Document Markup. You can now overlay 2D PDF documents such as plans, sections, or elevations directly in your 3D model to visualize information that would otherwise not be available. Download the three files from the links above and open all three in SMC by clicking File > Open. You can set the disciplines, categories, and short names to whatever you wish in the Ensure Model Disciplines and Categories popup window. In the Model Tree view of the Model layout, select the Clinic_A_2016_First_Floor drawing and click the Set to Selection Basket button. This will isolate the drawing in the 3D View. Next, we will pick two grid intersections (designated by green arrows below) in the drawing that will correspond to the same grid intersections in the 3D model. A dialog will open that allows you to scale, move, rotate, and tilt the drawing. A quick and easy method is to use the “Pick Two Dimensions” button. Click this button. The Dimension tool will activate and will turn into cross-hairs at specific points in the model that can be picked. Position the camera in the 3D view to the north-east corner of the model where the “H” and “.9” grid lines intersect. Hover the cursor over the intersection until it turns into a yellow crosshair. It may not snap directly to the point of intersection, but you can fine tune this later. Pick this point. Repeat this process by picking the point at the south-east corner of the model where gridlines “A” and “.9” intersect. A dimension line will now be visible in the 3D view showing the distance between these two points. You now must pick the same corresponding points in the 3D model. To do this, you must turn on Footprint Controls on the top toolbar and click Show Grids in the footprint controls. In the footprint controls, turn off Space Info, Component Footprint, drawings so that only the gridlines from the 3D model remain. Set the upper and lower footprint adjustment sliders such that only the grids that reside on the “First Floor” level remain. Repeat the process of picking the point where the 3D models gridlines “H” and “.9” intersect at the north-east corner of the model. Repeat the process of picking the point where the 3D models gridlines “A” and “.9” intersect at the south-east corner of the model. You should now see two dimension lines showing the distance between both sets of points. The drawings panel will also update with the correct scale and position translations for the drawing. Click Apply and click OK. The 2D drawing and the gridlines from the 3D model should now be aligned. NOTE: If the elevation of the drawing is incorrect due to selecting gridlines at a wrong level in the 3D model, you can easily correct this by setting the plane of the drawing to “0′ First Floor” in the drawings dialog. To ensure the 3D model is properly aligned with the 2D plan drawing, click the Show All button. 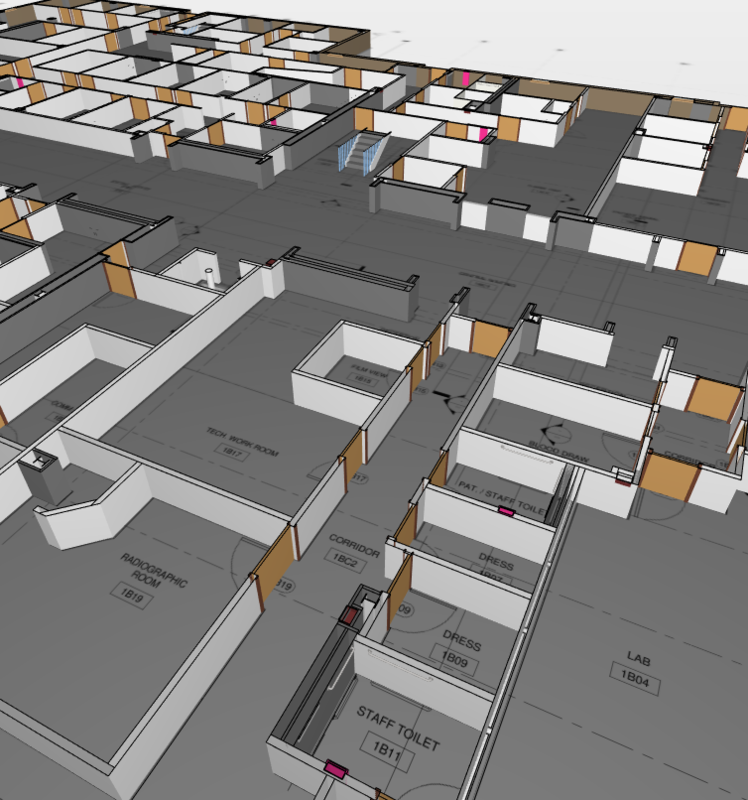 You can use the Sectioning Tool to section only the first floor and see the 3D Model along with the drawing. Below you can see that the model appears to be slightly off alignment along the X axis a couple of inches. In the Model Tree, right-click the Clinic_A_2016_First_Floor drawing and select Drawings… To move the model west 2 inches, enter -2″ in the Relative Δ X position textbox and click Apply. The drawing and model should now be aligned. For additional information on 2D Document Markup, please see “Drawings…” in the help topics.